Recently had an amazing entreé so blissful; it’s surely gonna leave you lusting for more. I had had once for dinner in a party , but since couldn’t savour it enough, I tried it the very next day . But I found something missing, so I added my homemade shezwan sauce to it…. Yup!!! That’s what gave the dish an exotic kick- a twist which I always crave while trying to replicate a dish I eat at a party or restaurant. This one is simply going to pamper your tastebuds and enthral your senses. Comfort food is the category in which this dish must rightly fall into. Hailing from Italian cuisine where cheese , being the most requisite ingredient, with a fusion of Chinese shezwan sauce, it’s a must try. Boil chicken cubes in ginger garlic paste . Drain and reserve the stock. In a wok , heat butter add flour and sauté until fragrant. Immediately add oregano paprika and chillies. Stir in milk and fresh cream and sauté for another minute. Add salt, pepper powder and veggies. Simmer for 3-4 mins until half done. Add chicken and stock. Pour in some water if required. Add half of the cheese,mix well and remove from heat. 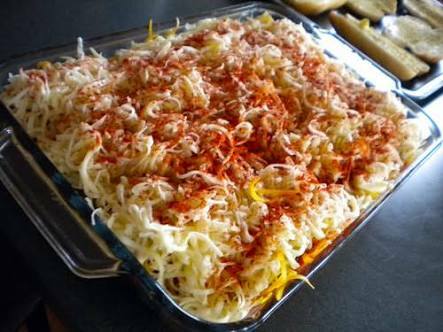 In an oven proof dish, spread2-3 lasagne sheets, pour half of the shezwan sauce and then pour all the white sauce mixture . Cover with the remaining sheets, spread the leftover shezwan sauce and the remaining cheese. Garnish with fresh parsley or basil(opt) . Bake in the oven for about 20 mins at 160 degrees F*. Enjoy when done. Do try this fusion recipe and keep looking into my blog for more fusions… Next one on my list Is Malaysian prawnswhich I had in South Africa at Kashifs…. A restaurant owned by a man wth the same name; also a master of fusion cuisine. So hang on for more…. This entry was posted in Uncategorized on August 18, 2016 by Samreen.